All-in-one surround sound systems are ten-a-penny these days, but it's not often we come across one with the credentials of the KEF KIT160. This 2.1, multidriver 5.1-home cinema system costs around £1,800, marking it out as a genuine high-end solution rather than a cut-price compromise. In the flesh, the impression is one of uncompromising quality – the main unit, speakers and subwoofer are solidly built and ooze style – but there's little evidence of the sort of connectivity overkill or technical geekiness that some users may find off-putting and confusing. KIT stands for 'KEF Instant Theatre' you see, and the idea is that you can have this system unpacked, set up and playing a DVD in a matter of minutes. That's a quite refreshing attitude. To this end, all the speaker cabling is provided and only one power socket is required. You can hook it up to your display via HDMI or component, with the former supporting DVD upscaling to 1080p and automatically setting itself to the highest resolution your screen can handle. 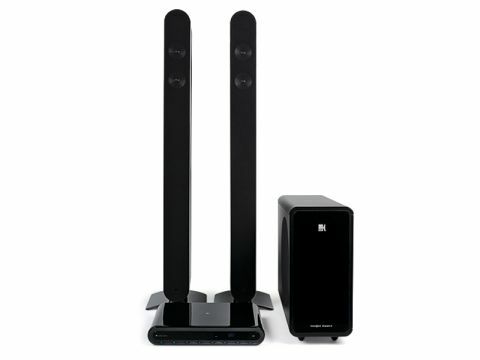 The speakers are easy to place and can be calibrated quickly from the setup menu. There's an option to connect external audio kit via optical digital (of which there are two) or analogue stereo inputs, and there's also space to hook up a KEFDock iPod dock if you need one. An HDMI input would have been handy for easy console hook-up. But t'was not to be. Virtual surround sound systems don't perform particularly well in my experience, but the KIT160's 5.1 processing works more successfully than most. The front soundstage is wide and involving, and you can up the volume on the centre to make it more distinct. Rear channel delivery is a little more hit and miss, with the surround effects coming from the left and right of your sitting position rather than from behind most of the time. At times the rear effects seem to disappear completely, but overall I was pleased with the results. The speakers have a crisp character with satisfying snap and clean treble, and the subwoofer delivers its lean low-frequency effects with plenty of power but a minimum of flab. This sonic prowess makes the system excellent for two-channel music playback, in fact, whether you're listening to CDs or MP3 tracks (playable via the rear USB port, also compatible with WMA, WAV, JPEG, BMP, WMV9 and some MPEG-4 and AVI files). At this price, I would've liked to have seen Super Audio CD and DVD-Audio support here too, but sadly both are off the menu. DVD playback quality is impressive, with Minority Report's high contrast car factory dust-up demonstrating the system's aptitude for smooth motion, minimal noise and accurate, contour-free colour gradation. While the KIT160 doesn't replace a traditional 5.1 setup, it's an excellent alternative for those unable or unwilling to deal with the hassle of one.